I totally love when new beauty brands come up on my radar. And when the brand is as intriguing and beautiful as SKEEM, liking it is a no brainer. While these candles smell fantastic -- and they do, they really do -- what I love most here is the packaging. 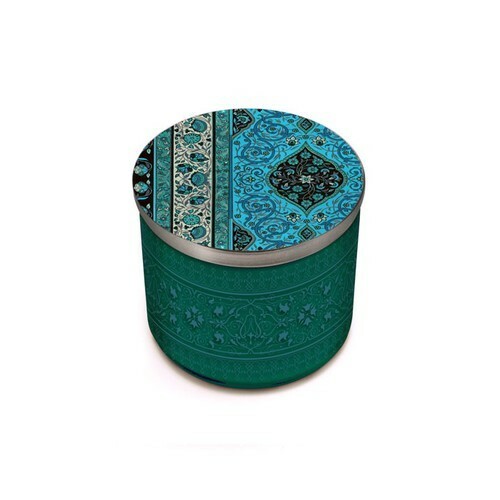 The sweeping designs on the jars are inspired by vintage fabrics and wallpaper patterns -- and they're so gorgeous, they can be reused after the candles have finished burning! I for one am looking forward to using my jars to hold cotton balls, Q-tips and the like in my bathroom. The scents really are fascinating. I've been burning the half-pint Dune Sage candle ($14), a unique mix of moss, sage and three types of beach pine. It's a sensuous mix of crisp and fresh woodsy notes that just fill a room beautifully -- and the half-pint burns for a whopping 50 hours! Other scents in the line include Guava Persimmon, Vintage Peony, Black Currant, Lilac Dandelion and Tea Leaf, just to name a few. They're available in half-pint ($14), 3-wick ($36) and pillar ($23). For more information and to purchase, visit skeemshop.com. That candle looks really pretty! I definitely want to try the Vintage Peony!